Our boudin food guide includes the answer to the question what is boudin sausage, how to eat boudin, and where to buy boudin. We learned. And, we learned in the world capital of boudin sausage. What is in Boudin? Boudin is almost a generic word for various types of sausages that are common in Cajun, Creole, and Acadian cuisine. Inspired by their French, German, and even Belgian counterparts, boudin sausages are completely different from the Italian versions. More similar to an Irish black or white pudding, a boudin sausage recipe usually includes rice as well as meat. It can also be made with pork blood, making it very similar to the Irish black pudding. As a result, there are white and black varieties, or boudin blanc or boudin noir sausage. Although the boudin sausage ingredients mixture that is stuffed inside the casing is pulverized to some extent, it’s a little less refined than a typical sausage. It’s more moist and loose. It’s normally served steamed, not grilled. And, in its most traditional state, boudin is not all that photogenic. Outside of Lafayette, Louisiana is a small town named Scott. Just off the I-10 highway, there are a series of boudin shops, all of which advertise boudin and crackling on large highway billboards. Billy’s Boudin and Don’s Boudin were suggested to us by folks in Lafayette. But locals continuously recommended only one top shop with boudin sausage for sale – The Best Stop Boudin. Scott is also known as the boudin capital of the world, so it seemed like a worthwhile trip from Lafayette on our search to answer the question what is boudin. The Best Stop is a small grocery store, specializing in butchered cuts, and marinated ready-to-cook meat. 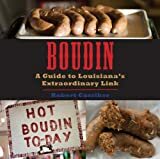 But, their real claim to fame is their boudin, which can be brought home, or eaten at one of the two red tables that are perched on the edge of the parking lot. As we tried to figure out what to order, we kept letting people behind us in line pass us up as we tried to figure things out. I really didn’t know how to eat boudin sausage like the locals. The only menu at The Best Stop is a paper one, on the counter just inside the door, which offered meats by the pound. Not exactly what we were looking for. It was more of a boudin to go menu. The person in front of us in line ordered 10 pounds of smoked Cajun boudin sausage. That’s a lot of sausages. In the end, I didn’t really understand how to make boudin sausage, so I didn’t know how to order it either. I stood there looking around and wondered what are boudin balls, and how do you boudin sausage in the first place. Ultimately, we had to admit our ignorance. I walked right up to the woman who stood next to the meat counter and said: “we want some boudin, but don’t know what to order.” She hooked us up. We tried one piece of traditional, steamed boudin. We also ordered some boudin sausage balls, which are deep-fried balls stuffed with pork and rice. We sat outside, baking in the morning heat, and laid out our spread of boudin. The steamed boudin was soft and tender, but my favorite was the Louisiana boudin balls. It was all tasty, traditional, and atmospheric, because we were, after all, sitting in a parking lot on the side of the road with a couple of boudin meals. Who knows what is in the Best Stop boudin recipe, but I can see why so many people said they have the best boudin in Lafayette. Throughout the next few days, we tried a few more types of traditional boudin. We tried more fried boudin sausage balls when visiting Louisiana Fish Fry. Prepared by Tony’s Seafood next door, I spent my lunch dunking the boudin balls with the Louisiana Fish Fry seafood sauce and remoulade. Of course, the platter also included fried shrimp and fried catfish, but for me, it was all about the boudin. But, the most surprising of the more traditional versions of boudin included a breakfast sandwich at Tiger Deaux-Nuts in Baton Rouge. Not only do they make their boudin fresh at the shop, but they sweeten it with syrup, and serve it with a perfectly cooked fried egg between two slices of a fresh donut. The sweetness of the donuts mixed perfectly with the savory, tender flavor of the boudin. It was heaven on a sandwich! And easily one of the most creative recipes using boudin. Many restaurants, though, are experimenting with boudin. Bringing it from the grocery stores to more fine dining. And coming up with some unique recipes using boudin sausage. Our first introduction to boudin was well before The Best Stop in Scott. It was in Long Beach, Mississippi, at Brackish Seafood Restaurant. We tried their house-made boudin balls. The deep-fried balls of rice and sausage were slathered in seafood jambalaya and gumbo broth and topped with crawfish aioli. It reminded me of an Italian aranchini, a mix of rice, beef, and tomatoes, rolled into a deep fried ball. It was tasty, but even after this I still was not entirely sure exactly what boudin was or how to cook boudin sausage traditionally. After all, at Brackish this boudin was an elevated version. I was pretty sure boudin wasn’t traditionally served with micro greens, after all. We also ate an elevated version of boudin at City Pork in Baton Rouge. Their version was almost a fusion of shrimp and boudin. The dish included uncased boudin with grilled Gulf shrimp, spicy red pepper aioli, and topped with fried shallots. This version of boudin was super tasty, but also topped with micro greens! The French Press in Lafayette took boudin to a whole new level during their Sunday brunch. It was almost the perfect mixture of traditional boudin in a more contemporary dish. Eric’s Cajun Eggs Benedict took a typical poached egg, on top of toasted French bread, slathered in a chicken and andouille broth. Plus, there was boudin! And, although Eric enjoyed his own Eggs Benedict for the first time in years, my brunch dish was something entirely unique. Famous throughout the state, the French Press’s Sweet Baby Breesus is a brunch homage to professional football player Drew Brees. The boudin French Press plate was loaded down with 3 biscuit sliders, topped with boudin balls, sweetened with cane syrup. To top it off, it was served with a generous portion of warm, cheesy biscuits. There is a reason why this dish is known throughout the state of Louisiana. It was a plate of southern decadence. When searching for traditional boudin, it’s almost guaranteed that crackling will be on the menu. This is not only the case at the Best Stop in Scott, but many highway billboards in the region advertise boudin and crackling as if they go together like peanut butter and jelly. And, in some cases they do. Crackling, or sometimes written as cracklin’ is fried pork deliciousness. Crackling is fried pork skin or pork rind. It is crispy and cracks between the teeth. The best kind seems to leave a little bit of pork stickiness on the teeth. The fresh crackling we ate at the Best Stop was sublime, both crispy and warm at the same time. It’s the perfect accompaniment to the softness of the boudin. Whether it is traditional or contemporary, it’s hard to eat along the Gulf Coast without coming into contact with boudin. Don’t ask what is boudin, just eat it! Check out our full guide on Where to Find the Best Gulf Coast Eats!